After so many years and whatnot, most fans would think that eventually the Pokemon movies would lose their charm that the first few gave. I was starting to believe that myself. What made Lucario and the Mystery of Mew so appealing was that instead of just showing a legendary pokemon and making it more epic than it really needs to be, this Pokemon movie took a step backwards and just didn't use a legendary pokemon as a main character (Mew seemed more as a side character) but Lucario was also close to the old atmosphere that made the older movies so great. The very first scene shows a raging two-sided war. That alone drew me in for I knew that this movie was much more than what Pokemon Ranger or The Spell of the Unknown was. It had the same feel as Pokemon 2000 and The First Movie. It was a fun ride, I'll tell you that. The animation was phenomenal in the movie. 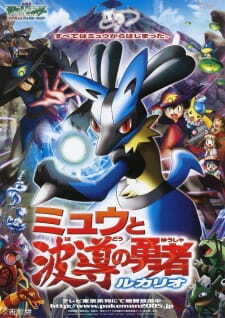 From the sparkling spirit of lucario's last moments to the action scenes, the movie never let up on the pretty graphics. Everything had a real fantasy look to it and it's very cool to see on a HD TV. The sound was great, even if a little familiar. The usual opening scene of Ash battling someone to the tune of a recent opening song from the main series (which was lost in some other movies) was a fun scene to watch. By now it seems the dub DVDs will never supply us with a Japanese track, which is disheartening to say the least. Lucario is by far one of the better "main" movie pokemon characters. He was lik a mix of Lugia and Entei combined into one and his personality was amusing. Sir Aaron was another likable character, though his time on screen is short. After Jirachi Wishmaker and Destiny Deoxys, many people thought that Pokemon movies were falling into a sinkhole but it's great to see that Lucario and the Mystery of Mew was able to pull through. I recommend it to the die-hard pokemon fans. And maybe a few others that are looking for something to watch on a Friday night. This movie, out of all the Pokemon movies, is my absolute favorite. The story line keeps you guessing, no matter what part it is at. I could watch this movie over and over and over again, and the ending is very moving. Anyone, even those who don't like Pokemn that much, will find this story absolutely great. They had a lot of new art, and the setting was beautiful.They had a lot of fun with the outfits (in the beginning). I did not see any art errors whatsoever. I loved the theme song (it is my favorite one) and I loved the ending song as well. All the songs in the middle during the different scenes really set the tone and mood. I have no complaints. The whole thing with Lucario being involved was a true throw-off from what the Pokemon series is use to. The only characters that are humans are extreme minor characters (except the Pokemon Hunter; she was a Major Minor character, but she did not fill an important role). I loved this moving. Whenever I watch the ending, I can't help but shead tears. I could watch this over and over, and I wouldn't get sick of watching it. Overall, this is my absolute favorite Pokemon Movie so far. It has great backbones in the plot, and they did a lot of changes I wish would continue throughout the rest of the movies and series. Oh, Mystery of the Mew, what shall I do with you? Mew was so fricking cute in this. And Lucario was a badass. Honestly and completely unironically. Yet, with a clear conscience, I can't recommend this film. Maybe you should bother if you're an avid fan of Lucario or Mew. The movie is so ambitious, yet the script is dreadful. So, where do I start? Better get good out of the way. Soundtrack was fine, even if not on the level of the first or fifth film. Art, on the other hand, was not fine - it was much better. Just like in the last film, artists did a great job. While not breaking standards set by the first, third and fifth films, some images present in here will stay vivid for days after you've watched it. Mew and the Aura Hero: Lucario certianly did a lot better than Jirachi and kept the consistency of Deoxys's flick. What else was good? Lucario ended up being a well crafted character, even if a bit stereotypical. Relationship with his trainer was completely predictable and some of Lucario's lines towards his master were really bad (made him sound like a sexually submissive other). Fortunately, this didn't diminish Lucario's character. His interaction with Ash was a bit more aggressive that Pokemon sequels usually dare to go, even if it was for only a few minutes. And well... Did I mention landscapes? There's some georgeous landscapes in here. When discussing this film, I can easily break it down into three main sections. That is to say, the film shifts gears twice, changing its style. These sections are at the castle, aproaching the mountain and in the mountain. Of the three, the only one I'd characterize as good is the second one. It's also the shortest. Considering that the opening scene is the same as in so many other films, I don't have much to say. It wasn't particulary bad, but I can't say much good about it either. It's just there. I guess seeing a hundred copy-pasted pokemon fighting was neat, though. Now we get to the real begining of the Lucario and the Mystery of Mew. Film lures us in with neat arhitecture. We get to really enjoy the location for a few minutes as Ash battles another trainer. A bit later into the act, film uses classy outfits to draw us into a rich party. Both of these disguise the main problem of the film for only a few minutes. After the wow factor fades away, you start to notice the dialogue and interactions between the characters. Simply put, they aren't interesting. There are a few pokemon only shenanigans used to distract the viewer, but they're not nearly as effective as in most other films. At one moment Brock sees a girl and opens his stalking notebook. As he reads through the insanely stupid list of gal's achievements, you cringe at this catastrophic attempt at comedy. The party drags on forever and it's only after Ash summons Lucario that things get a bit interesting. How did he do it? Due to lazy writing, of course. For some unexplained reason his aura is the same as Lucario master's (even if their characters are nothing alike). What a cop out! A chance to make the premise of the film interesting is ignored. Throughout these first 40 minutes of the film, we're treated to multiple scenes of Team Rocket and other characters doing irrelevant things. All in all, there's around fifteen minutes of footage which should have definitely been scraped, as it adds nothing to the experience. After film shifts geas, we're sent on a journey towards the crystal mountain. The journey is perilous since, well... No one's been there. As baffling as this is, the following 20 minutes feature some neat scenes and atmosphere. Ash and Lucario clash, Lucario gets to act tsundere and a few jokes are genuinely funny. On the other hand, the stupidity doesn't leave. We discover some flowers which record and show the past. And apparently no one's ever tried harvesting this power, or at the very least we aren't informed of it, as film finds it irrelevant. Next up, the gang trriggers a thousand year old crystal flower with Lucario master's memories. How this is possible, I don't know. As the gang is attacked by underwhelmingly weak Regi legendaries, we approach the third act. In the third part of the film we're treated to a fun subplot - Mew & Pikachu playing. A few of their scenes were shown earier, but the culmination of the subplot happens here and I gotta give credit where it's due - they look adorable. As for the main plot, the film completely breaks down here. Starting here, the film contains numerous vices and sins that Pokemon films indulged into throughout the years. There's the sentinent mountain's very own defense system against humans (no, I'm not joking), villains having acces to impossible technology, there's shallow mysticism, characters surviving impossible falls and nature acting in baffling ways. Yes, Pokemon was never about realism, but within every work exists a treshold where things turn to schlock. This film breaks the Pokemon scale. Yes, I could go in depth and explain each and every thing wrong with it, but this is a review, not an in depth critique. Not to mention the length of this piece is already going too far. The gist of what I'm saying is - at a certain point you simply stop caring as the rules have been bent too far and the whole work becomes boring. Then the film ends with a somewhat interesting sacrafice, but you're too far gone to care much. At the very least they didn't ruin Lucario's character. I'm left with two distinct impressions; I see a neat concept with a nicely realized character. I also see a mess of a film with no consisteny, a boring first part and inane second half. There are a few neat Lucario moments sprinkled therein, but I can't recommend it to anyone expecting a good film. Fortunately for Lucario and his Mistery, there's a rabbid fanbase of the character out there. And this fanbase will go through the fire and the flames just to watch him some more. This film is tailored for them, even if it is a trainwreck. So, enjoy the movie, I guess.